Lawn edgers make grassy front and backyards look well-manicured and maintained. It helps to create distinct boundaries between the lawn and nearby sidewalks, fences, or landscaping. Without a lawn edger, it would be difficult to have a neat yard using a lawn mower alone. For a perfectly manicured lawn, you’ll want to invest in one of the best lawn mowers as well. We reviewed dozens of lawn edgers to figure out which one was the best. We considered manual and electric models at all price points. We compared functionality against cost and customer feedback. The BLACK+DECKER LE760FFAM Landscape Edger stood out as the clear winner among the dozens of lawn edgers we reviewed. It is an extremely popular model that’s fairly affordable considering its list of features. It also has a lot of positive customer feedback available online. The BLACK+DECKER LE760FFAM Landscape Edger is an extremely popular lawn edger from a leading manufacturer. It is affordable and comes in a black or bright orange color. Nearly 2,000 customers have left mostly positive reviews about their experience using this lawn edger. This model features a powerful 12 amp high torque motor capable of powering through all of your landscaping needs. Its 3 position adjustable blade gives you options when it comes to the look of your lawn. The built-in cord retention system keeps your cord secure within the edger itself and not in a tangled mess. The Worx 32-Volt GT2.0 String Trimmer/Edger/Mini-Mower with Tilting Head and Single Line Feed is our runner up because it provides extra features that many other trimmer and edger combinations don’t have. On top of being a trimmer and an edger, it is also a mini lawn mower. Its smaller cutting area than a regular lawn mower makes it ideal for cleaning up tight areas. That way, you can have a clean and neat lawn with fewer tools that can do more work. 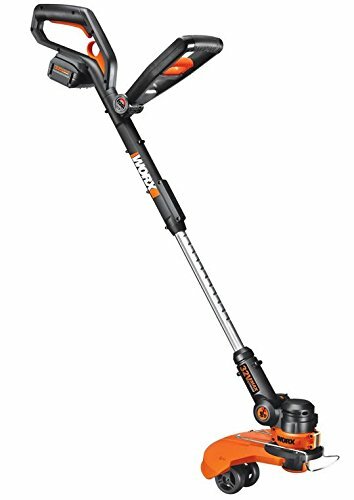 One of the best features of the Worx 32-Volt GT2.0 String Trimmer/Edger/Mini-Mower with Tilting Head and Single Line Feed is its adjustable head. It uses an easy-to-adjust head system that allows it to quickly convert from a trimmer to an edger with a simple twist. Combined with an adjustable front handle and neck, you can easily position this unit in a way that is the most comfortable for you. The AMES Companies 2917200 Border Edger is our top budget choice since it combines the best value at an affordable price. At $26, it is an affordable option for improving the overall look of your yard. It has a serrated blade that can easily cut through plants without a lot of extra effort on your part. The footplate also helps you disperse your weight evenly for a better cut. With a rigid frame, this edger will not bend or break under pressure. The handlebars are covered in a soft-grip rubber padding to minimize the stress on your hands. That way you can spend all the time that you need to finish cleaning up your yard and making it look the way that you want it to. 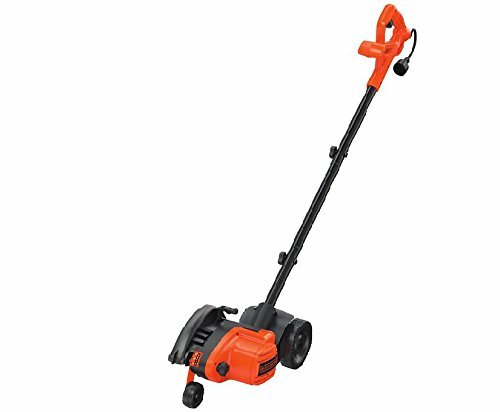 This Worx WG896 12A 2-in-1 Electric Lawn Edger, 7.5-Inch is our top pick for electric edgers since it provides the best features for fast and efficient performance. It is powered by a 12A motor that delivers more than enough power for the work that needs to be done. Combined with a serrated steel rotary blade, it can cut through anything. The best feature of this edger is its ability to cut. It has a three-position adjustment system so that lets you choose how deep you want it to trench your edges. It can cut up to 1.5-inches deep. It also comes with a cutting line indicator that will help you cut in straight lines. The Troy-Bilt TB516 EC 29cc 4-Cycle Wheeled Edger with JumpStart Technology is our top pick for gas lawn edgers. It has a nine-inch blade that is durable and easily adjustable. That way, you can get the best results for different lawn conditions. This edger also has JumpStart and Spring Assist Starting Technology, which lets it start and run smoothly. You don’t have to worry about mixing gas and oil either. One of the best features of this edger is its portability. It has a tall ergonomically designed handle, which is also foldable to fit in most transports. It also has large wheels to easily cross over obstacles for a smooth even cut. Homeowners should buy a lawn edger to be able to maintain their yard on their own. If you currently pay a lawn maintenance service, you could save money by purchasing a lawn edger to use in addition to your lawn mower. You can keep your lawn in fantastic shape with minimal labor. If you own a commercial property, you may want to buy an industrial grade lawn edger to keep in the maintenance closet. Using a lawn edger can keep your property visually pleasing. This can be important to how potential customers view your business. Manual vs. motorized. There are manual and motorized models of lawn edgers available. The manual models require you to push them along, whereas the motorized versions use power and may have additional tech features. Gas vs. electric. For motorized lawn edgers, you can choose one that uses gas or electricity. Some versions have a battery that can be charged, while others require access to a wall plug. Transport wheels. Transport wheels make it easier to move the lawn edger to where it is needed and to use it along your lawn. These wheels reduce the need to carry the edger. Blade length. The longer the blade, the less time it will take to edge your lawn. However, longer blades tend to only be available in more expensive models. If you have a small yard, it may not be worth the extra cost. Ergonomic handle. A lawn edger with an ergonomic handle is more comfortable to operate, with a design that reduces hand fatigue. Cutting line indicator. A cutting line indicator is a permanent line or measurement on the lawn edger that makes it easier to achieve an even and symmetrical cut across your lawn. Amps. Amps refer to the amount of power used in the lawn edger. A lawn edger with more amps likely has more power and costs more than a model with fewer amps. Blade adjustment. Adjustable blades make it possible to customize your edging to meet your needs in terms of lawn height and size. Battery pack. A battery pack means that you don’t have to plug the lawn edger using a cord into the wall. Charger. Battery operated lawn edgers sometimes have chargers that you can use to recharge it. What is a lawn edger and how does it work? A lawn edger is a gardening tool that creates neat edges for your grass lawn. You put the blade of the lawn edger between the sidewalk and grass to get a uniform cut. What safety gear should you wear when using a lawn edger? When operating a lawn edger, you should wear long sleeves and pants to protect your skin against flying debris. Wearing goggles can protect your eyes. In addition, you should wear ear protection, such as earplugs, to prevent hearing loss from being exposed to loud noises. What grade of gas should you use for a lawn edger? The grade of gasoline your lawn edger requires depends on the model you purchase. However, most lawn edgers need at least a minimum octane rating of 89. At most gas stations, this is mid to premium grade gas. How do you start a lawn edger? Lawn edgers may offer some variation in how they start. Most lawn edgers require you to push in a lever and pull a cord to start it. The two-step process ensures that it only operates when you want it to. 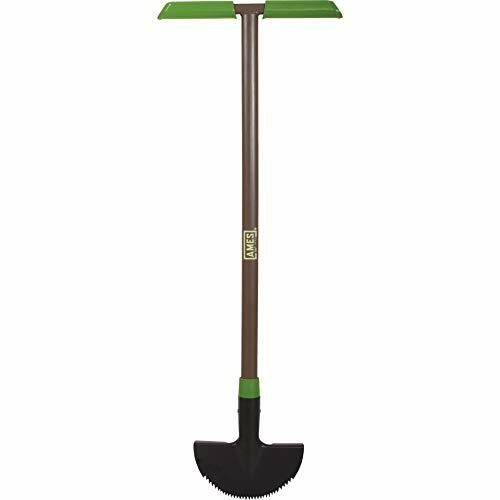 We looked at 20 other lawn edgers. Even though they didn’t make our 5 best lawn edgers list, they’re the best of the rest and each is still a great option for your home. The information you’ll need to compare each one is included with the listing. The BLACK+DECKER LST522 is a good starter option for your home lawn care needs. It is compatible with BLACK + DECKER’s 20V MAX system where all of its devices share the same battery. That way, you can charge one battery pack for all of your lawn care tools, and you don’t need to keep combustibles like gas around your home. It also has a 2-speed control with an automatic feeder so that you can add power when you need to cut through something tough. 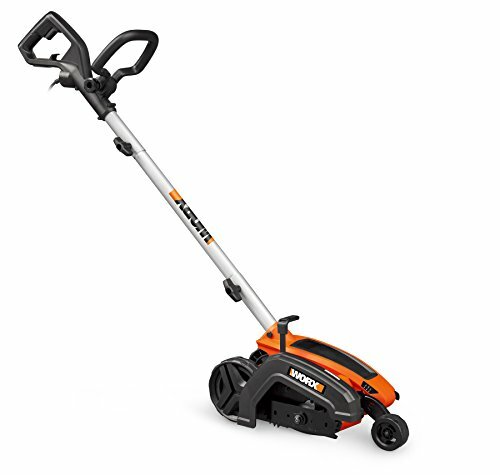 This BLACK+DECKER LSTE525 package offers more versatility for home lawn care. It can be used as a trimmer, but it converts to a wheeled edger as well. It has a Power Drive transmission which increases the amount of torque it generates. Combined with a multi-speed system, you can use it to cut through very tough edges with ease. You’ll also get two batteries, which lets you get more than enough power to get the job done or to use with other 20V MAX tools. For a different design, try the Greenworks 12-Inch 24V Cordless String Trimmer/Edger. It works as a trimmer or an edger thanks to its rotating head design. An adjustable series of handles make it easy for anyone to use, and it is quiet compared to other tools. It runs entirely on a 24V battery, eliminating the need to have gas around. It also has a 12-inch wide cutting path, which makes big jobs much faster to finish. If you have a bigger job to do, check out the Greenworks 13-Inch 40V Cordless String Trimmer/Edger. It has a 40V battery, which is substantially bigger than many other options. That way, you get a much longer battery life to tackle bigger jobs. The cutting area is 13-inches so that you can cut large areas much faster. The cordless design and easy-push button controls make it easy to take and use it anywhere that you need to go. If you have other Ryobi tools around your house, then consider getting the Ryobi P2052 ONE+ 18-Volt Cordless String Trimmer/Edger. It is compatible with the Ryobi 18V battery system so that you can interchange the batteries easily. This trimmer/edger combo has a foot-wide cutting area and a wide foot guard to protect your feet. It also has the easy-to-see safety color that Ryobi is famous for. That way, you and your tools are highly visible even in lower light levels. The VonHaus 40V Max Cordless String Trimmer/Edger offers an alternative in the 40V range. It is compatible with VanHaus 40V MAX battery system so that you can power all of your tools with a single battery system. This pack comes with a battery and charger included. The VonHaus 40V Max Cordless String Trimmer/Edger has an ergonomic design, making it a good choice for prolonged use. It also has a soft-grip handle that keeps your hands from getting tired quickly. The Worx WG154 20-volt Li-Ion Cordless Grass Trimmer/Edger is different from other trimmers in several key ways. The front handle is fixed and ergonomically designed to give you better leverage other the trimmer head. The 20V battery charges quickly in about 5 hours so that you can have it fully charged when you need it. The line feeds automatically so you won’t have to stop often to fix it. The default cutting are is 10-inches for more precise cutting. However, you can extend the cutting area by several inches so that you cover large areas quickly. This package comes with the battery and the charger included so that you can get to work right away. This Worx WG163.9 20V Cordless Grass Trimmer/Edger is a good option if you have thick landscaping and gardens. It comes with a guide that also works as a flower spacer to help you keep the plants that you want while getting rid of the ones that you don’t. It quickly converts into a wheeled edger thanks to a rotating head and quick release system. This trimmer is compatible with Worx’s 20V battery system. However, it does not come with a battery or a charger. That makes it a good choice if you already have other Worx tools with 20V batteries. The BLACK+DECKER BESTA512CM Electric Mower 12″ 3in1 Compact Lawn Mower is a useful option if you need a versatile tool. It serves as a mower, a trimmer, and an edger, which lets you get done all of your yard work with one tool. There is an integrated cord holder to make sure that you don’t run it over. With an efficient Powerdrive transmission and an auto feed spooler, this tool can handle a lot of different jobs efficiently. Having an edger that doubles as a trimmer can be helpful, but and edger that is designed to be nothing but an edger often gives you the best results. This CM 2-in-1 110V Electric Corded Lawn Edger by Craftsman provides a cleaner cutter with wheel guides. It uses a hardened steel blade that can cut through almost anything, as well as quickly and precisely cut plants to a uniform edge. The blade has three adjustment positions so that can get the exact cut that you are looking for. It can even cut a trench edge up to 1.5-inches deep. The VersAttach System 8″ Straight Shaft Edger Attachment with Blade Guard can be used with the Honda UMC425/435 powerheads to edge your lawn. When you snap it on using the SureLoc joint system it firmly attaches without a hassle. When not in use, it has a storage hook for easy storage in your garage. It has a long neck to easily reach the ground, and the wheel system helps guided it in a smooth, easy-to-control line. 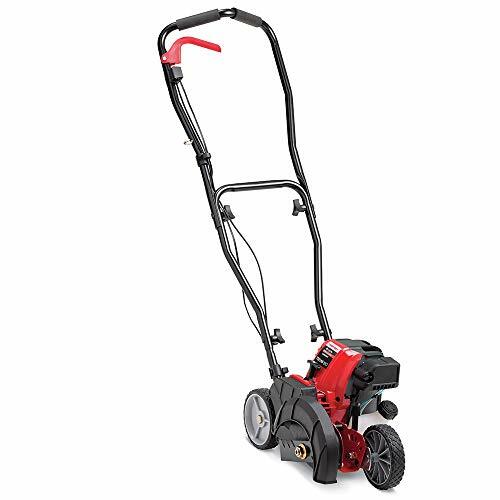 The McLane 101-4.75GT-7 9-Inch Gas Powered Lawn Edger can be a big advantage in larger homes or commercial uses. It is gas-powered and mobile, making it easy to cover large areas quickly. The wheels are seven-inches for easy rolling and the ability to get over most obstacle easily. It is equipped with a 4.75 gross torque engine that provides more than enough power to cut through most plants without stress. The control system is easy to use as well since it has a single lever that controls the blade level and depth control. For a more powerful option, try the McLane 801 5.50GT Gross Torque Briggs & Stratton 9-Inch Gas Powered Lawn Edger. It has a larger and more powerful Briggs & Stratton engine with up to 3.5 HP and 5.5GT (gross torque). The unit is easy to use with the same simplified controls as other McLane models. The eight-inch wheels have ball bearings so that they roll smoothly and stay balanced. If you need a more precision guide, then you can get the McLane curb wheel attachment to help you guide the edger along the curbs. The Southland SWLE0799 79cc Walk Behind Gas Lawn Edger offers a more commercial option for lawn maintenance. It features a larger triangular three-pointed blade for efficient cutting and a longer lifespan. The blade is adjustable in terms of the angle and the depth. It can cut up to 2.5-inches deep. The frame is made out of metal so that it is stronger and will last a long time without issues. If you are cutting an area with a lot of curbs, this unit works really well thanks to its curb hopping ability. It can lift itself up onto the curb with extendable wheels. While an electric or gas-powered edger can be nice, there are times when you may want to do your edging by hand. That is where the Bully Tools 92251 Round Lawn Edger with Steel T-Style Handle and other manual edgers come in. It resembles a shovel but with a flat 12-gauge steel head. It is designed for home or commercial use with strong steel components and an easy-to-use design. For commercial projects, you can get them in multipacks up to four units. The Fiskars 38.5 Inch Long-handle Steel Edger is a great option for home use. It has an easy-grip handle that is both comfortable and maximizes your grip. The shaft is long to prevent bending for anyone at any height. The blade is solid steel and sharp enough to cut through most plants easily. Plus, it has an extended foot platform to help you balance and maximize your cutting power using your bodyweight. The Lesche Full Steel Round Half Moon Edging Tool for Gardening Grass Edge is a good option for edging around delicate plants. It has a 10-inch wide blade that can easily fit into most areas. It is also made of aircraft-grade steel and can stand up to just about any amount of pressure that you could put on it. The Radius Garden 22611 Root Slayer Edger, Red can be useful for edging around permanent plants in your landscape. It covers a small area efficiently and is easy to control. The 13-inch mid -carbon steel blade can cut through and rip out the roots of plants that you don’t want making it harder for them to come back. It is lightweight and easy to carry to the space where you need to work. This Truper 32100 Tru Tough Rotary Lawn Edger is one of Truper’s top-selling items. It has a 48-inch long wood handle for easy reach and length. The rotary head design makes it easy to cut through plants efficiently. The head is clear coated so that you can use a garden hose to spray it clean. That way, it is easy to maintain. The Yard Butler Step Edger Manual Steel Lawn Garden Sidewalk Grass Long Handled Foot Edging Tool is a lightweight and versatile option that is easy to use. Its thin frame design makes it a great option for simple and quick jobs. The extended foot shelf makes it easy to leverage your full weight if need be. The blade also has saw teeth for more efficient cutting.